﻿ H.G. de Wolff - Reclaiming Marx's "Capital"
A century ago the idea got the upper hand that economic systems are in principle in a state of equilibrium. This paradigm conflicts with the theory of Marx to such an extent, that it had to make marxism marginal. Since his three-volume work Das Kapital is called outdated. Sam de Wolff is among the few, who at the time questioned the paradigm of the equilibrium. De Wolff points out, that the technological progress leads to a continuous increase of the labour productivity. Therefore during a time period the prices will usually fall1. They are not in equilibrium. Here De Wolff is a temporalist, long before this term was introduced in the economic science. It took sixty years before the theory of Marx in her temporal form was developed further and formulated in a rigorous manner. This break-through has occurred thanks to the American economist Andrew Kliman. In 2007 he has made his version, the so-called temporal single system interpretation (in short TSSI), also accessible for relative outsiders, by describing her in his textbook Reclaiming Marx's "Capital". So this title refers to a title itself. Kliman proves with his many discussions in this book that his ideas are independent and original. The originality of Kliman is at the same time his largest strength and weakness. She makes Reclaiming Marx's "Capital" exciting to read, but she deters probably the adherents of the common economy. For Kliman does not try to link up with the mainstream, precisely because he is fond of polemics. Therefore the TSSI has found little professional approval, and her popularity remains sectarian2. Moreover his polemics is often directed against colleagues in this already marginal group of co-marxists. This leads to a debate among insiders. Only readers with a vivid interest in modern marxism will truly appreciate the arguments of Kliman. 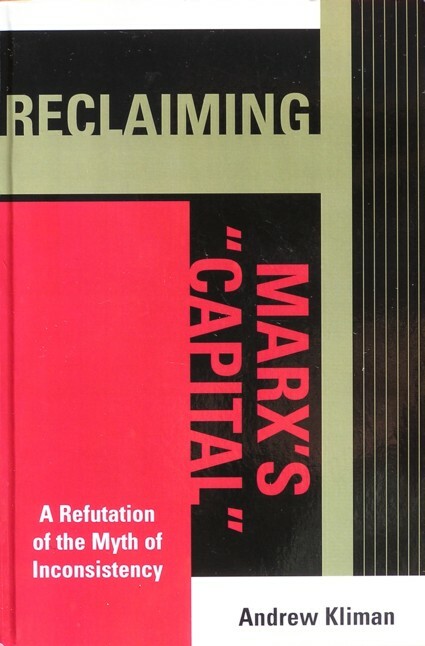 Thus Reclaiming Marx's "Capital" contains many passages, where the original texts of Marx are dissected in a precise manner in an attempt to discover their purport and meaning. Kliman himself asserts that Marx is often vague, and makes statements, which are susceptible to various interpretations3. One may naturally question whether this kind of love of truth is fruitful. Nevertheless, this is the task that Kliman undertakes to do. He wants to formulate the theory of Marx in a clear manner, and in such a way that everything fits. He calls this an exegesis, an explanation of the text. The fourth chapter of the book is dedicated to this method of research, and on the requirements that accompany the coherence of a scientific analysis. This does not mean that the theory of Marx is described completely. On the contrary, it is desirable that the reader has already read an introductory text about marxism. Already in the second chapter Kliman dives deep into the various possible interpretations of the theory of Marx. According to Kliman two points of conflict must be addressed. The first one concerns the conflict between the dual system and the single system. According to the dual variant the labour value and the money value of a product must be calculated separately. In the single system variant these two values are simply related to a proportionality constant, the so-called monetary expression of labour time (in short MELT). Kliman prefers the second variant. The second point of conflict concerns the conflict between the simultaneous and temporal determination of the product value. The simultaneous interpretation refers to the equilibrium approach, which has just been mentioned. During a time period the prices retain their value. In the temporal interpretation the technological progress causes price changes. Kliman prefers the temporal view. Now the theoretical frame is chosen, and Kliman continues with a description of the various controversies, which visit marxism. The most important controversy is the so-called transformation problem of labour values into prices, and Kliman analyzes her in the third chapter. The law of the tendential fall in the rate of profit (LTFRP) is also discussed here. The fifth and sixth chapter give an elaboration and further explanation of the various interpretations, that circulate in the modern marxist science - besides the TSSI. Although there are mutual differences, all interpretations except for the TSSI believe that the theory of Marx contains errors. In the seventh chapter Kliman analyzes the LTFRP. In principle a falling profit rate is naturally conceivable, and for instance the famous economist J.M. Keynes thinks that she will probably occur. But the LTFRP has been criticized intensely since its introduction. Now Kliman shows that in the TSSI the fall of the profit rate does take place. He rehabilitates the LTFRP of Marx. In the chapters 8 and 9 Kliman explains his greatest achievement. For here he shows that in the TSSI the transformation of labour values in prices can be done without complications. For the sake of completeness he also presents calculations by means of several alternative interpretations, which thus reject the ideas of Marx himself. Next Kliman explains in chapter 10 the so-called fundamental marxist theorem. This is a slightly older interpretation, which tries to correct the theory of Marx. In fact the theorem itself appears to be faulty. Since the TSSI has rehabilitated the transformation as proposed by Marx, the theorem has of course become superfluous. Kliman loves polemics and new ideas. Therefore he analyzes in the eleventh chapter several studies, that compare the theory of Marx with experimental data. Kliman concludes that the studies are faulty. These remarks are irrelevant for the TSSI, and therefore can be omitted from the book. Kliman mobilizes his own opposition by including this additional chapter. Be right is one thing, and be put in the right is another. But when Kliman believes in a cause, he tells about it. The consequences of the TSSI can be called spectacular. But the situation is still unclear. Notably in the TSSI the rising productivity results in a continuous change of the labour values and of the prices of commodities. This phenomenon is questionable. Experts with respect to the theory of Marx know that for industrial branches with a high capital intensity she predicts prices lying above their labour values. However in the TSSI this is a constantly advancing process, so that some prices may rise in a perpetual manner. In his book Kliman has not elaborated on this point. Apparently he believes that the exegesis has been completed, and he does not want to study her consequences. He is an interpreter, but not a model builder. The economic magazines contain a lot of polemics against the TSSI. Also here the dynamics of the TSSI are criticized. The main point of concern is the MELT, which transforms the labour values into prices. The adversaries state that such a MELT does not exist. Unfortunately their arguments are not very transparent. Your reviewer, although not a total layman, is unable to judge if they are right. Time will tell. For the time being, anybody who loves the theory of Marx and the classical paradigm can enjoy Reclaiming Marx's "Capital"4.